Easter is the pinnacle of the Christian year. We celebrate the rebirth of all God’s Creation through the Resurrection of Jesus Christ. Holy Week leads us through the suffering and death of Jesus. In the liturgies of Easter Vigil and Easter Day, we rejoice in the certain knowledge that death has been defeated forever through the resurrection of Jesus the Son of God, by the grace of God the Father and in the great power of the Holy Spirit. Our Holy Week begins on Palm Sunday on April 14 . At the 8 and 10 a.m. services, the altar party begins the Liturgy of the Palms in Pearson Hall and then processes into the church. We do this to recall the triumphal entry of Jesus into Jerusalem prior to his passion. It is traditional for parish members to take one-hour vigil watches with the reserved Sacrament of Christ’s Body and Blood until the Stations of the Cross at noon on Friday. A sign-up sheet will be available in the office and in the Narthex to volunteer for this solemn duty. Good Friday is April 19 and has two distinct services. First, at 12 noon there will be the Liturgy of the Stations of the Cross . Father Joel will lead the Stations in the Nave. At 7 p.m. on April 19, we will have our Good Friday Liturgy , a somber and penitent Liturgy of the Word with the Passion Narrative . 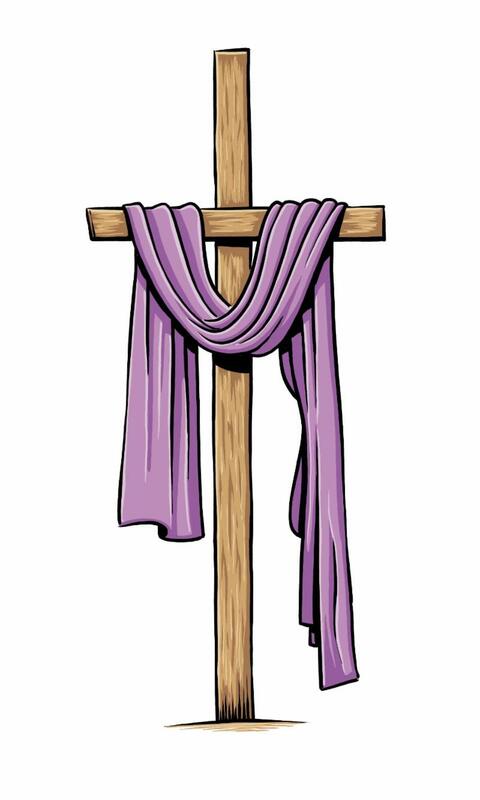 We do not have Holy Communion on Good Friday services since we are recalling the death and absence of Jesus Christ in the world during this time. On Saturday evening April 20 at 8 p.m. we will begin our Easter Vigil . This is the First Communion of Easter . The Vigil itself is a remembrance of salvation history and ends with the lively celebration of the Resurrection of Jesus Christ . I strongly encourage you to participate in this ancient liturgy of the Church. On Easter Sunday morning, April 21 , we will have two glorious services ( 8 and 10 a.m. ). Easter Day is a wonderful time of reunion as many who may not have attended church lately will be present for these services. It is important that we welcome these visitors graciously in Christ’s Name. This is also an opportunity to remember someone special or to give thanks for God’s blessings in your life by making a donation for Easter flowers or by giving a gift in their name as an Easter offering to St. Andrew’s. Easter services are also a time to invite family and friends to St. Andrew’s to participate in the beautiful music and liturgy we enjoy at all our Easter services. Blessings in the Name of Our Risen Lord!